All voters in Wisconsin must be registered to vote. To check your registration or obtain the registration form you can search on the website https://myvote.wi.gov/. If you have been issued a WI driver license and it is current and valid, you must provide the number and expiration date. If you have not been issued a WI driver license you must provide either your WI DOT-issued ID number OR the last 4 digits of your Social Security number. You must provide a Proof of Residence Document when registering to vote in Wisconsin. A Proof of Residence Document is a document that proves where you live in Wisconsin. How and when may I register to vote? PLEASE NOTE: State and federal law now requires that all voters submitting a registration application by mail provide a copy of an acceptable identifying document that provides proof of residence. Acceptable forms of proof of residence are outlined in number 3 below and on the second page of the Application for Voter Registration form. The copy of the form of proof of residence must be included when submitting the registration application. If a copy of proof of residence is not included, the elector will be required to supply it before being issued a ballot at the polling place or before being issued an absentee ballot in the municipal clerk’s office. *Forms with an expiration date must be valid on Election Day. In Person Register in the Village Clerk’s office up to 5:00 P.M. or the close of business (whichever is later) on the Friday before the election. You must always provide proof of residence. A current and complete residential address, including a numbered street address if there is one, and the name of a municipality. 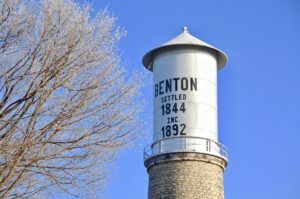 Information regarding candidates running for the Village Board or for the Benton School Board will be posted on the “Keep Informed” tab of the website. Persons wishing to run for either board must take out papers during the month of December, prior to the April election. Nomination papers for the Village Board are available at the Village Office at 244 Ridge Avenue. Nomination papers for the School Board are available at the school’s office at 41 Alma Street.